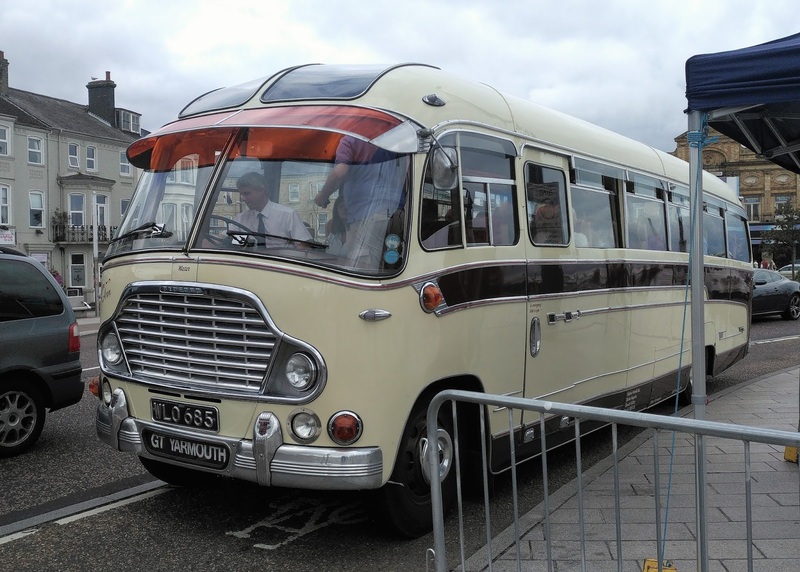 This week's Throw Back Thursday features a Great Yarmouth Transport Daimler double decker. FEX110 was one of five Daimler CVG6s with Roe bodywork which were new in May 1961. 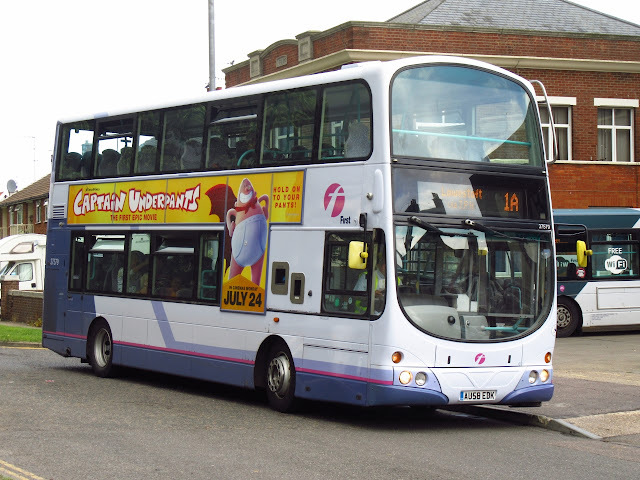 First Eastern Counties is amending some Lowestoft services from 3rd September 2017. 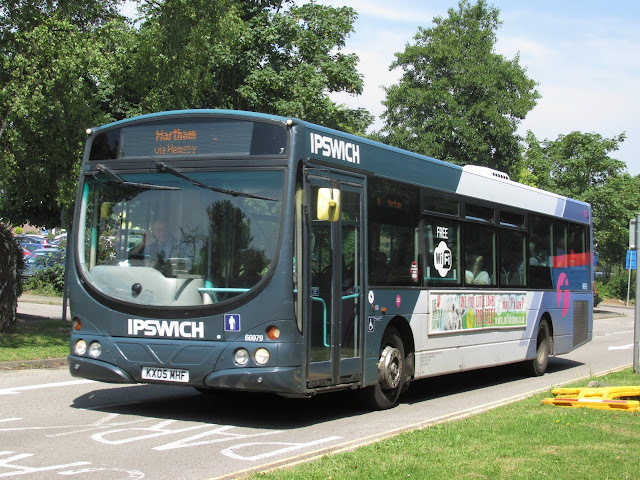 The timetables of the 106 Lowestoft to Burnt Hill and the 99/99B Lowestoft to Southwold are being revised whilst the route and timetables of the 925 Bramfield Road, Halesworth to Bungay High School and the 103 Lowestoft to Carlton Colville will also change. Richard & Audrey Hipkiss of Sutton Road, Catfield is to cancel its Feline DRT route serving Gimingham, Buxton, Burgh, Brampton, Tuttington from 1st September 2017. D R Fosdike Limited has applied for permission for an operating centre for one vehicle at Corner Harris, Fairview Road in Halesworth. BorderBus recent acquisitions, Scania OmniCity deckers LX59CNC/E/J, are also becoming more common on the 580 Waveney Line service between Beccles and Great Yarmouth following their debut on Latitude services. 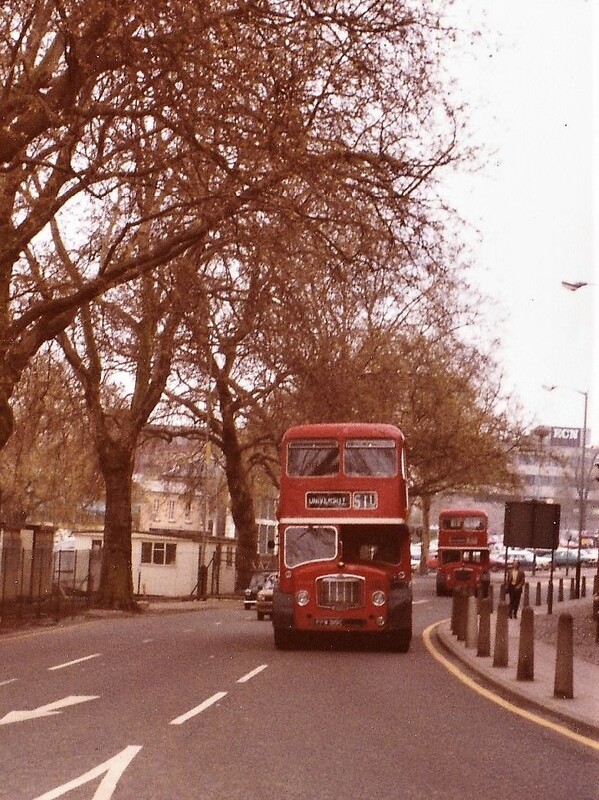 They were formerly with Stagecoach London as their 15138/9/41 and are noticeable for their red livery. 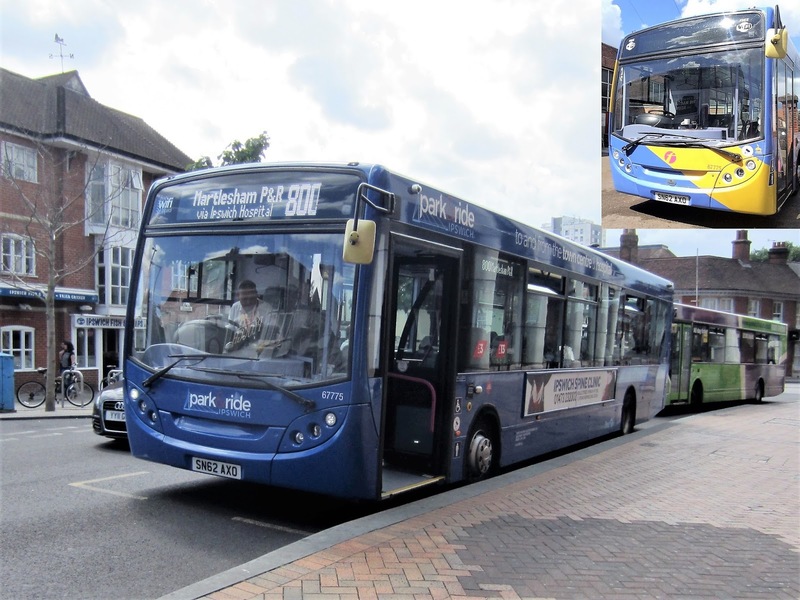 The first port of call was the Old Cattle Market bus station where I captured Galloway's Optare Solo 360 (MX59AWF) laying over with 119 Framlingham displayed on its destination screen. Whilst the other half was shopping, I wandered down the end of Carr Street to view activity on St Margaret's Street. That is where I observed former First Great Yarmouth Eclipse 69009 (AU05DMX) getting its kicks on route 66! After lunch (and yet more shopping) I went back to the Old Cattle Market bus station and saw another Ipswich P&R Enviro300 in the form of 67775 (SN62AXO) on Dogs Head Street. I saw 67775 two months earlier at the rear of First Great Yarmouth's depot in a completely different livery. Another blue liveried bus was Beestons East Lancs OmniDekka YN55NJZ about to leave the bus station on the 91 to Sudbury. An interesting visit which filled some of the gaps in my photo library plus the surprise meeting with fellow enthusiast Trevor Arbon and his wife. 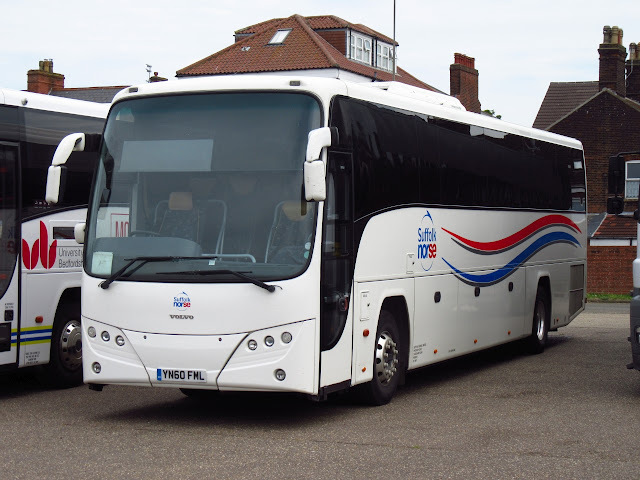 Rollesby-based Jubilee Coaches is a relatively new business in the area, being incorporated in early September last year. In the following month an application was made for an operating centre at Jubilee Farm which is located off Fleggburgh Road in the village. Another month passed when the application was approved for five vehicles at the site. 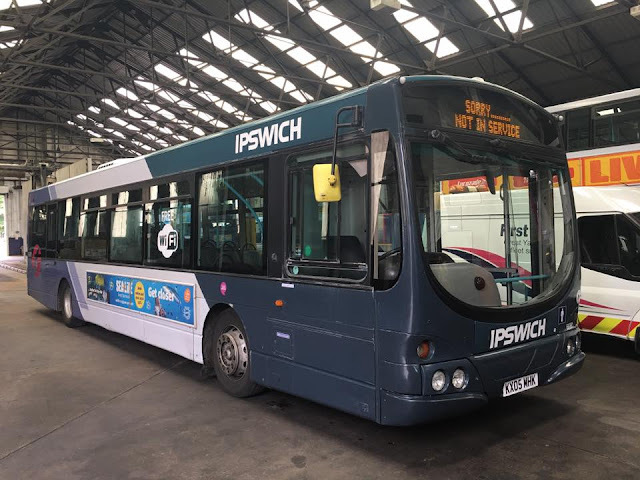 Other than a photo of A400NNK, supplied by David Bell, appearing on the blog earlier this year, (see Norfolk and Suffolk Tour - dated 21st April 2017) I was unaware of the identity of any other vehicles in use by the operator other than it had subsequently acquired three Bedfords. That was until this week, when Kevan Portas supplied a photo of their Plaxton Paramount bodied Bedford YNT registered VJI8206 (ex-B360DDW). 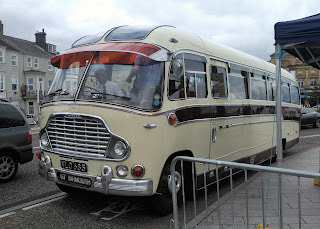 The coach, together with A400NNK, was originally owned by Turner and Butcher of Kenninghall which subsequently passed to Norfolk Coachways of Attleborough after the former ceased operating. Today we are concluding our look at Eastern Counties double deckers in the late 1970s and early 1980s as part of our Throw Back Thursday feature. The nearest Eastern Counties LFS is FPW319C, which was new to the company in October 1965. After spending much of its time allocated to Kings Lynn, it was withdrawn from service in November 1981. It was subsequently disposed of to dealers APT of Bracebridge Heath, near Lincoln. Looks like at lot of visitors in use at Caister Road today, i managed to photograph 3 Loanee's at the depot this afternoon, good timing on my part! 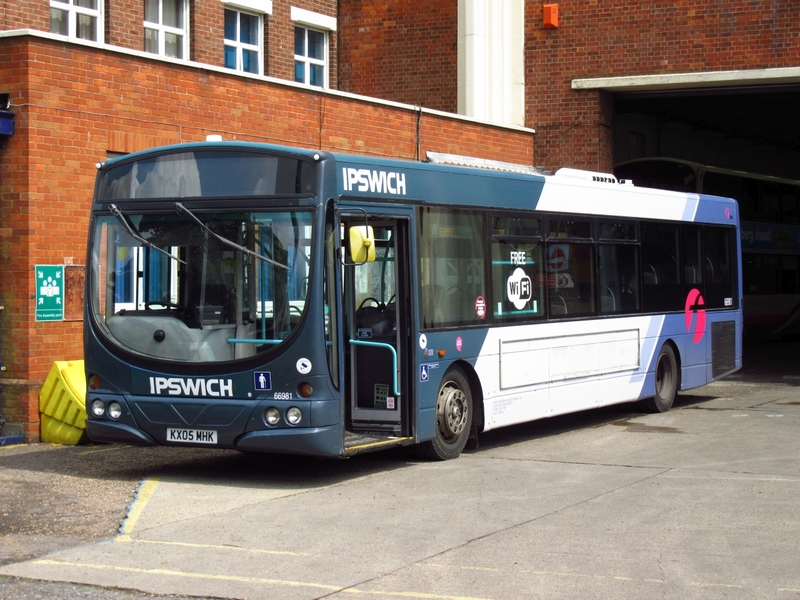 Along with those above, Lowestoft Volvo B7TL 30900 and Norwich Streetlite 47508 were also noted in use from Caister Road today. There's quite a few local entries in this week's Notice and Proceedings Report by the Eastern of England Traffic Commissioner. The main points concern the the provision of school services for the coming school year plus the registration, alteration and cancellation of many of Sanders Coaches' services. Sanders Coaches has registered two new school day services both commencing on 3rd September 2017. They are the 704 between Sutton Road, Hickling and Stalham Junior School plus the 401 from Cherry Tree Road, Plumstead and Sheingham High School. 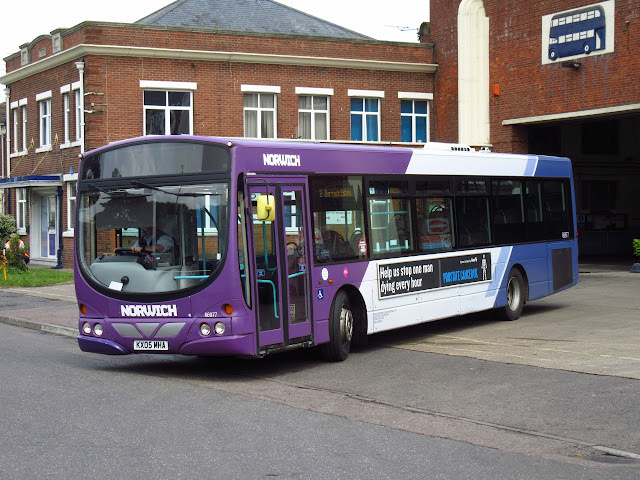 Ourhire Limited is to provide normal stopping service 33A starting and ending at North Walsham. Commencing on 3rd September 2017, the Monday to Friday service will comprise three full and five short trips each day. Our Hire is also to run a Monday to Friday hail and ride service 33, from the same date, between North Walsham and Cromer. 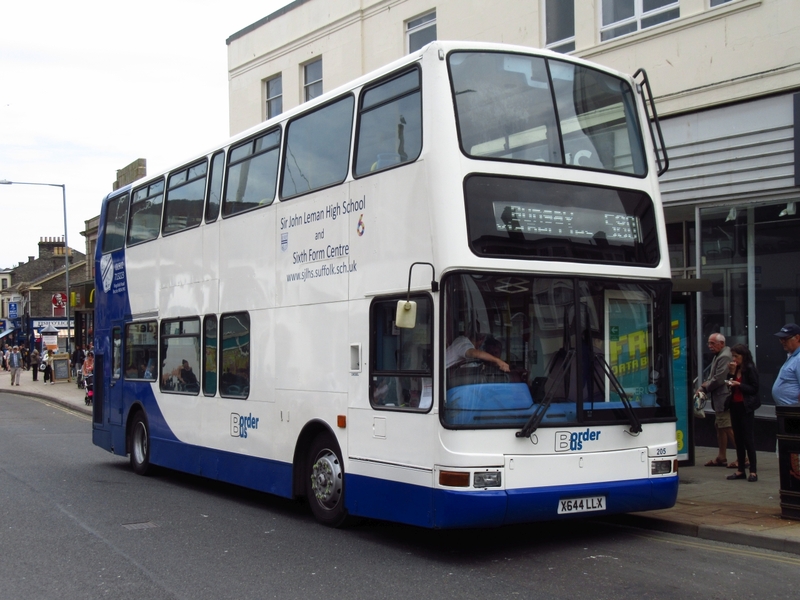 Go West Travel is to amend the route and timetable of its 414 school service between North Elmham and Reepham High School from 6th September 2017. Ourhire Limited is altering the timetable of its 271 Hemsby to Bradwell service from 3rd September 2017. ⧫ 5 Charles Road, Holt to Post Office, North Walsham. ⧫ 6 Post Office, North Walsham to Market Gates, Great Yarmouth. ⧫ 6A Post Office, North Walsham to Cromer Bus Station. ⧫ 34 Post Office, North Walsham to Stalham former railway station site. ⧫ 27/28 Green Lane, Pudding Norton to Morrisons store, Fakenham. ⧫ 44/44S Holt and Holt and Sheringham Station Approach. ⧫ 45/45A Norwich and Holt. ⧫ 46 Holt and Fakenham. ⧫ 210 North Walsham and Norwich Bus Station. 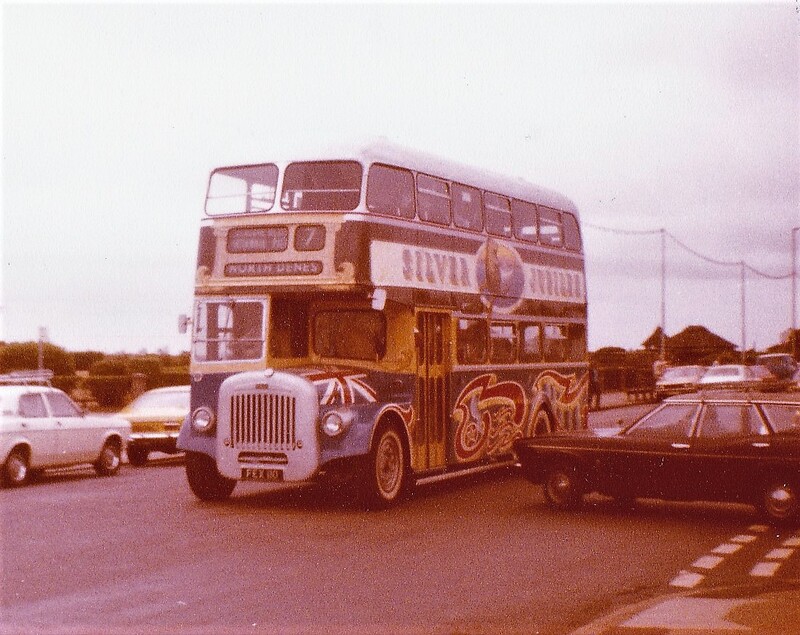 ⧫ 834 Stalham to Great Yarmouth's East Norfolk College. 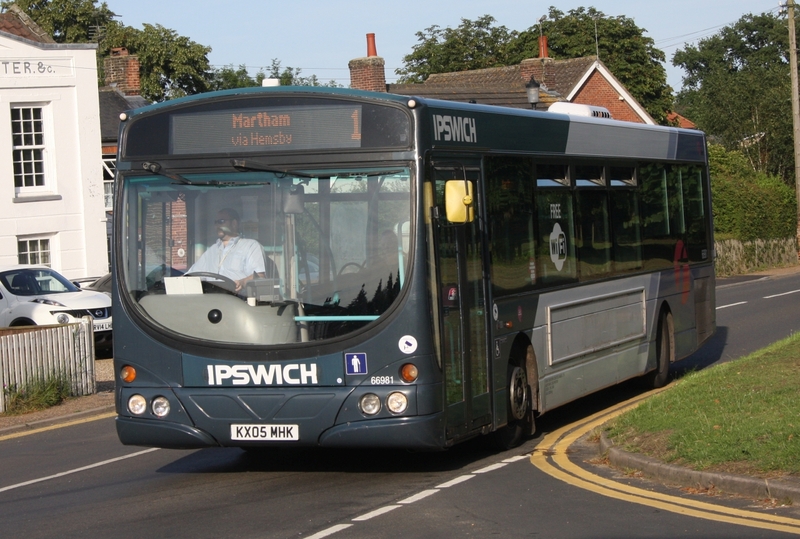 ⧫ X44 Reepham to Norwich High School. ⧫ X55/55 Post Office, North Walsham to Norwich City Centre. ⧫ 9 Holt and Fakenham. 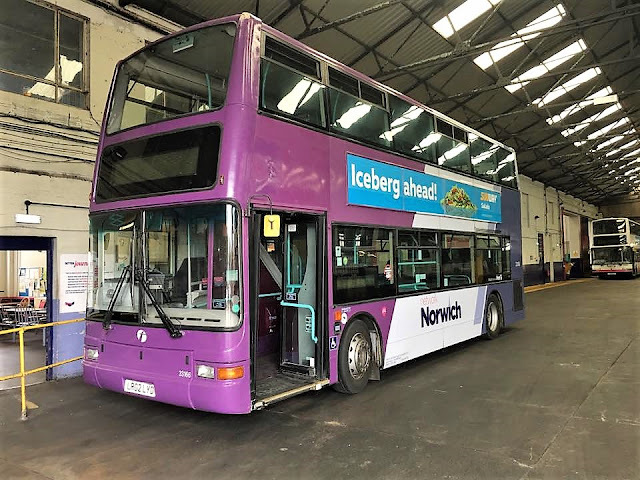 ⧫ 43/43A/43B Reepham Market Place and Norwich Bus Station. ⧫ 204 Holt to Wells High School. ⧫ X11/10 Happisburgh Post Office and Norwich High School. ⧫ 607 Holt to Reepham. ⧫ 609 Melton Constable and Reepham High School together with a new start and finish point. All changes to Sanders services are to take effect from 3rd September 2017. ⧫ 7 Gresham School and Park Lane, North Walsham. ⧫ 16 Cadogan Road, Cromer to Holt. ⧫ 17 Holt to Sheringham Station Approach. ⧫ 19 Cadogan Road, Cromer to Holt. ⧫ 33/33A North Walsham to Cromer. ⧫ 86 Felmingham and Aylsham High School. ⧫ 706 Sea Palling service. Hope you have got all that! The complete Notices and Proceedings Report can be viewed HERE. With this week being the last one of the school year, many schools are organising trips out to various attractions in the area. 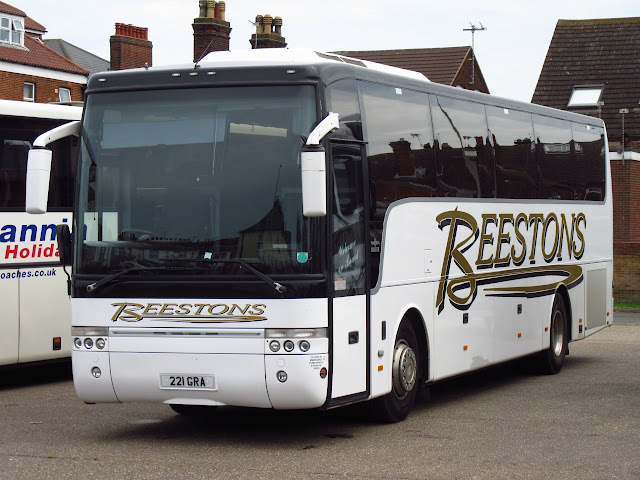 Yesterday and today I have seen at least four Reynolds Coaches each day awaiting Lynn Grove students on Beccles Road for trips out but alas no camera was present! Meanwhile, First Norwich Purple Line 33166 LR02LYD continues in use in Great Yarmouth today being employed on the 8 route between the James Paget Hospital and Caister's Second Avenue. As luck would have it my home village was the backdrop for some photos of loanee Volvo B7RLE 66981 KX05MHK which is spending a few days at Yarmouth prior to heading to Norwich to be transformed into a Red line vehicle. It was noted earlier in the day working the 1B service before changing to the 1 service between Lowestoft & Martham, it is seen above in Ormesby St Margaret this evening heading towards Martham. 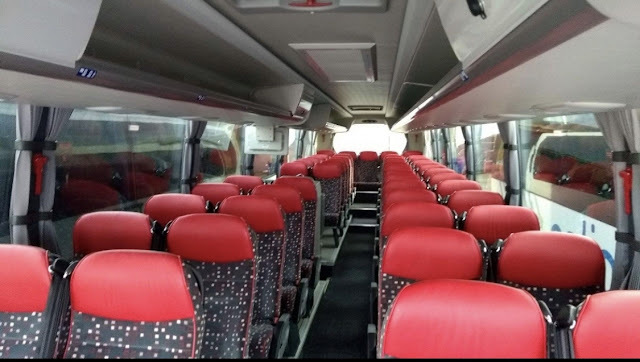 We have been kindly informed that Ambassador Travel have been using Scania Demonstrator YN66WOJ on loan for some of their Sunrise tour duties. 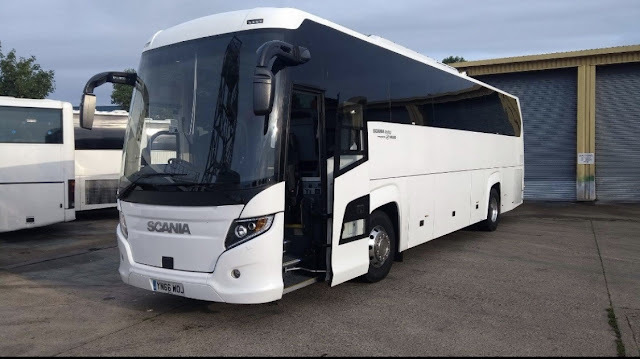 It is the same Higer Touring spec as the two Scanias recently added to the fleet, it is due to return to Scania Bus & Coach at Worksop tomorrow. Thanks to Will Drake for the info and Photographs from Ambassador. This morning has also seen Ipswich based Volvo B7RLE 66981 KX05MHK move down to Caister Road prior to moving along to Norwich to gain a Red front for use there. 66981 KX05MHK at Caister Road this morning. 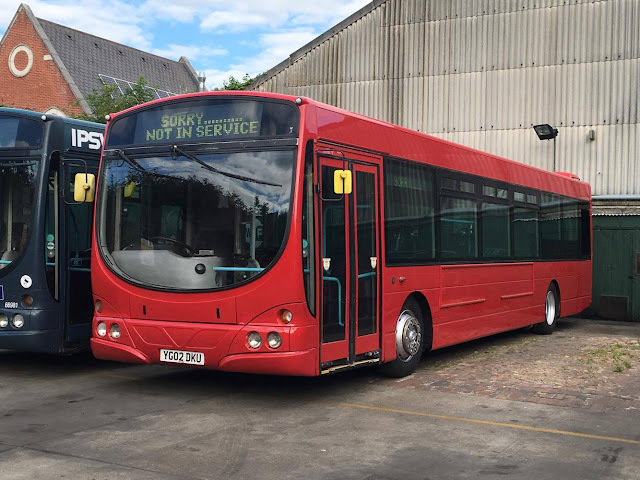 Another Volvo B7 60916 YG02DKU is being repainted into the same Red Heritage livery as Double Deck Volvo B7TL 32479, it was pictured at Ipswich Depot yesterday prior to being collected by Norwich staff for the finishing touches, it was repainted at Simon Morris in Ipswich. Many Thanks to First for the Photos. Grahame. A few sightings from a trip into town this morning, all captured whilst heading for Breakfast! First up is Borderbus Volvo X644LLX which was working the 580 to Bungay, pictured here outside the old BHS store in Yarmouth Town Cenre. 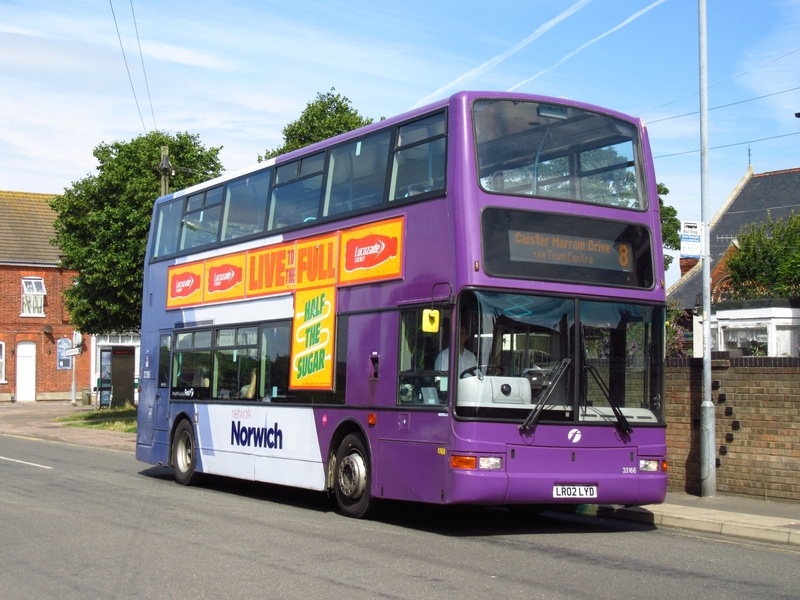 Next up following on from Roy's post yesterday, Norwich Purple line liveried 33166 LR02LYD was noted on Beaconsfield Road working the 8 to Caister. On to Beach Coach Station where a couple of local coaches were noted having a day out. First up is Suffolk Norse Volvo/Plaxton Panther YN60FML with Beestons Volvo B12/Van Hool 221GRA (WA05WLD) parked alongside it. 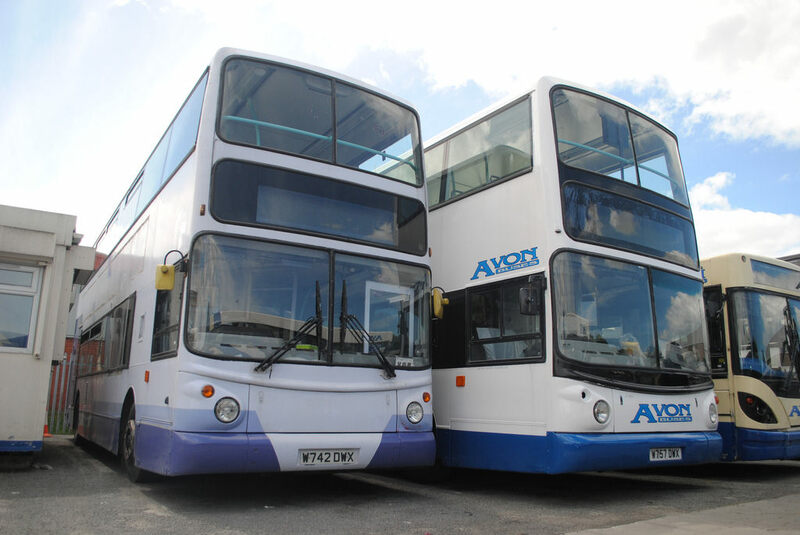 With the help of Ryan Durrant, I have located another photo of the twosome at Avon Buses depot on the North Cheshire Trading Estate in Birkenhead taken in early June. Cody Cooke's photo shows 757 has been repainted into the Avon livery and looks very smart, whereas 742 still wears the First group "Urban" livery. My thanks to Cody for the use of his photo and to Ryan for the heads up. With the appearance of a First Norwich Purple Line decker at Caister Road today, I just had to entitle this post Purple Haze as a tribute to my favourite rock guitarist, singer and songwriter Jimi Hendrix. The bus was Dennis Trident 33166 LR02LYD and was at First Great Yarmouth's depot for its annual MOT. It was quickly borrowed for use in service as one of its StreetLites was in London today providing shuttles between the London Excel centre and the various sports venues for the World Paralympic Athletics Championships. 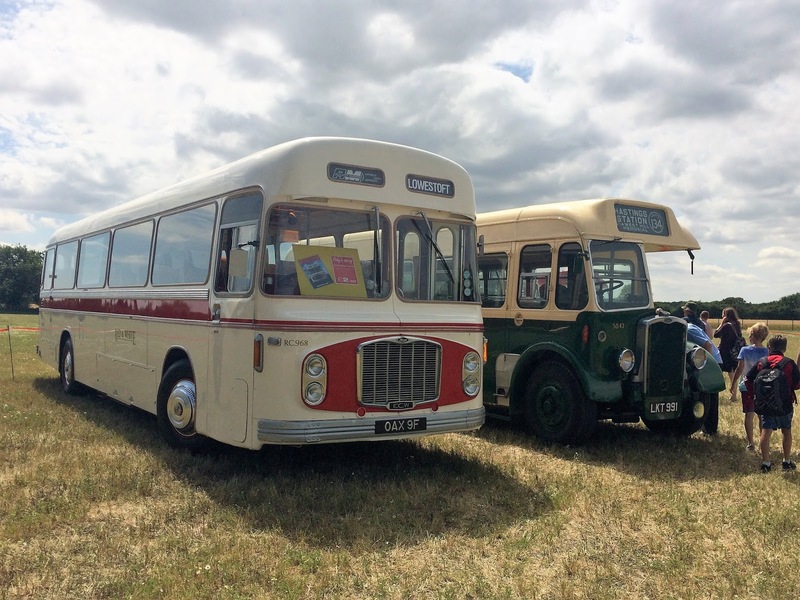 The Eastern Counties double decker theme continues with this week's offering. But before we get to that I can update you a little on last week's feature on BNG886B as Syd Eade offers a more recent photo taken in Belgium during August 2014 This can be seen in the original post ( #TBT ~ Eastern Counties BNG886B). My thanks Syd. This week we see another Eastern Coach Works bodied Bristol FS5G AVF579B. 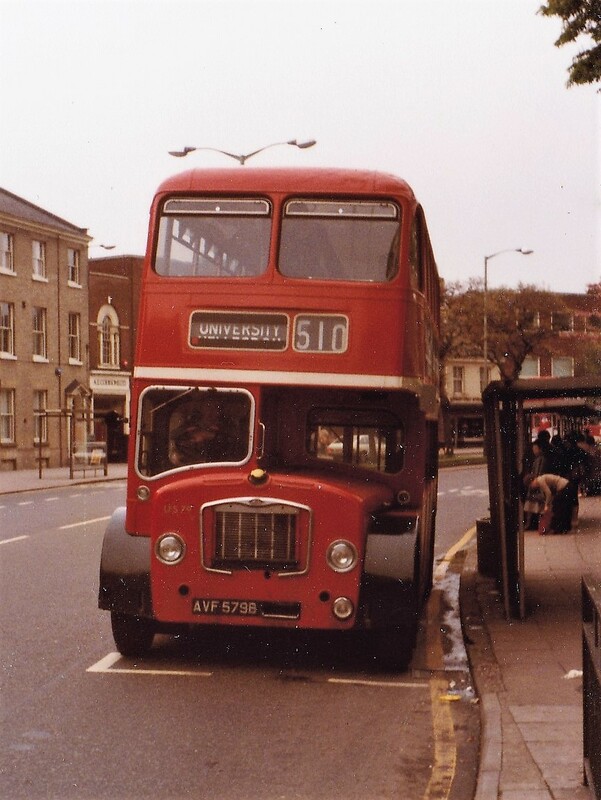 It was new to Eastern Counties in May 1964 as LFS79 and after being based at Cromer for a short period it became a Norwich based bus. It is seen here at a very quiet Castle Meadow in 1980. Withdrawal came in July 1981. For the second consecutive week there is only one local entry in this week's Notices and Proceedings Report, published by the East of England Commissioner. Surprisingly many coaches and lorries were parked at Beach Coach Station during yesterday evening and I am not too sure if this is a regular occurrence or just a one off. In addition to the independent operators present, the regular short break touring companies were much in evidence - four from Alfa Travel, three from Shearings and the solitary National Holidays' example. Over the last couple of days, the Great Yarmouth Wheels Festival has been held along the town's seafront. 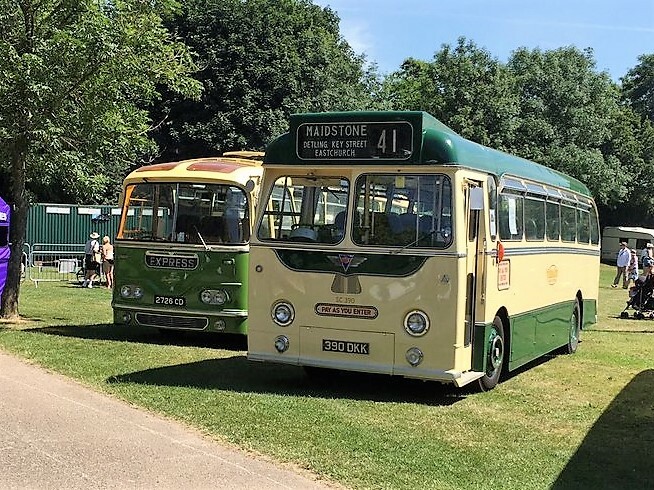 On display has been a range of classic and contemporary vehicles with visitors able to ride between the town and the seafront display areas in a classic 1959 coach. 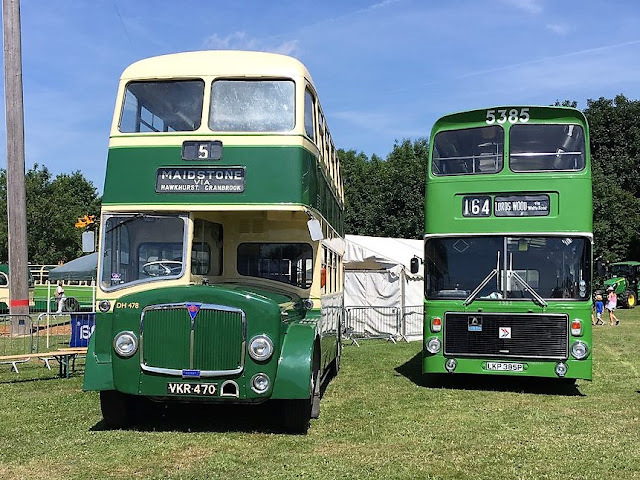 As in last year's event, the vehicle used was WLO685 a privately owned and restored Duple Super Vega bodied Bedford SB3, new to Curries of Bexleyheath. Now owned by Sidelines of Long Stratton, it is often used by Spratts of Wrenningham on a number of mystery tours and vintage themed excursions. My thanks to Kyle Hewett for bringing this to my attention. There were some visitors to Beach Coach Station during yesterday evening that were worthy of note. 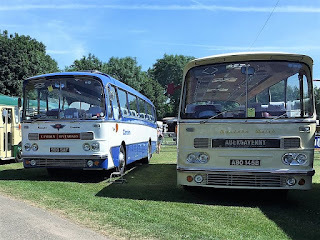 The East Anglian Transport Museum holds its special event to commemorate the closure of Lowestoft's Eastern Coach Works just thirty years ago and we were there yesterday. Although the day started dull and overcast, by the time the gates were open the sun was out and it was feeling warm. 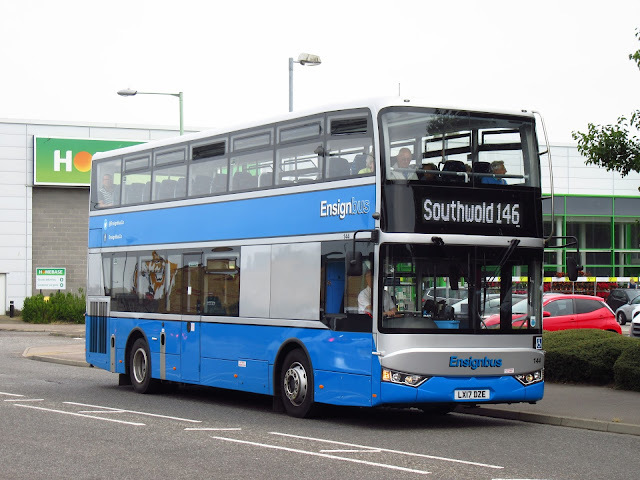 I used the Park and Ride service (right) from the Co-op store in Ashburnham Way with First Eastern Counties thoughtfully providing Gemini 37572 AU58ECW. On entering the site Leyland Olympian D367JJD was parked beside Lowestoft Corporation AEC Swift YRT898H and I was hopeful of a ride on the former which unfortunately didn't materialise! I then came across London Transport LUC389, an AEC Regal lV with an ECW C39F body, new in 1951. Turning the corner, I then observed another West Yorkshire bus in the form of 1962 Bristol SUL4A 811BWR on sentry duty guarding the entrance to the new museum extension into the field behind. There were three groups of vehicles in the field and the first contained Red and White Services preserved 1968 Bristol RELH-6L/ECW bodied RC968 OAX9F alongside 1950 Bristol L6A LKT991 from the Maidstone & District fleet. Today is the first day of the three day Kent County show held at Detling, just north of Maidstone in Kent. 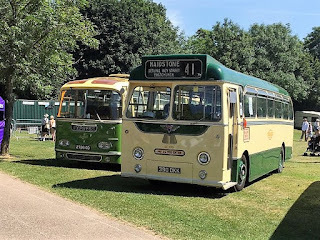 The show has an area especially set aside for heritage vehicles and Glenda Brown has been kind enough to send in some photos of some of the vehicles present. 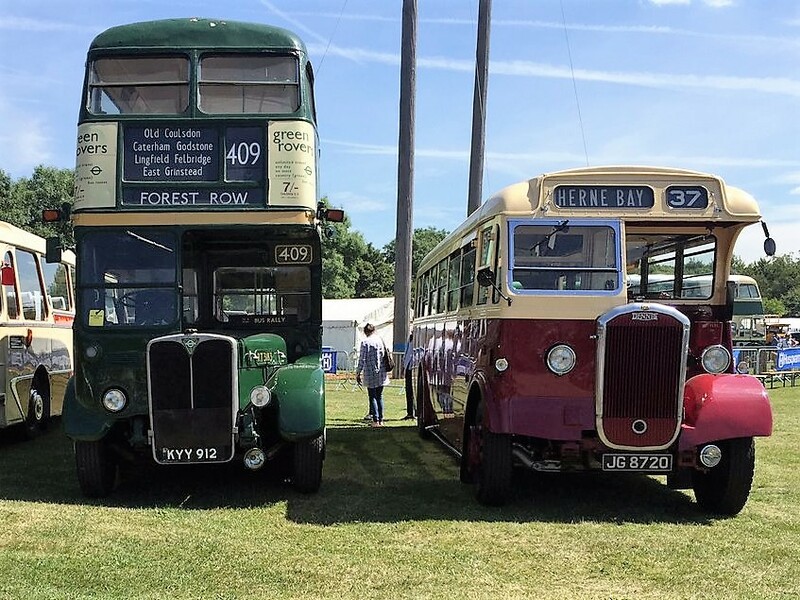 The first picture shows 1950 built London Transport Weyman bodied AEC Regent III RT3183 (KYY912) alongside former East Kent Dennis Lancet II JG8720 of 1937 vintage. The second submission shows a beautifully preserved 1964 Western Welsh AEC Reliance /Harrington Grenadier ABO 145B. On the left is 900SAF, a 1963 AEC Reliance with Harrington Cavalier bodywork. 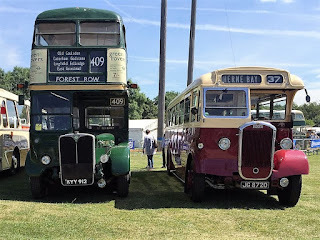 The third shows two double deckers - on the left is Maidstone & District AEC Regent / Park Royal VKR470. It was new in June 1956 as its DH478. On the right is another Maidstone & District bus - Volvo Alisa B55-10 / Alexander registered as LKP385P with fleet number 5385.